Stock your kitchen's cleaning supply with this 50 gram, standard weight scouring pad! Made of coiled stainless steel, this reusable pad is rust- and corrosion-resistant, lasting you through multiple cleanings. The pad's rough surface makes it perfect for removing even the toughest, baked-on food and grease stains from your pots and pans. From caked-on ziti to other burnt-on food particles, grease and residue, this scouring pad will cut down your staff's cleaning time and effort. It can also be used on other various surfaces. From cook tops to grills, this pad is a versatile cleaning agent! Its standard weight also makes this ideal for lighter use. This is a great value! We use these stainless steel scour pads to scrub stainless surfaces in our kitchen. If you keep them in a drainage rack you will extend the life of each pad for multiple uses. Stainless steel standard scouring pads used to scrub our pots and pans. I tried the heavy weight ones and like these better. great size and quality. I would recommend them. These stainless steel scouring pads are really great. They are very strong on pots and get off hard to remove dirt. These are great for every kitchen. This is a large package of scouring pads for residential use.In my household, they will probably last me a year! They easily store under the sink, though. These inexpensive scouring pads do a great job and should be a staple in your cleaning arsenal. Burned on food is easily removed either this scouring pad—Not much elbow grease is needed. I recommend. This is a great scouring pad. Perfect for all of those tough to get stains on those pots and pans. I highly recommend these in all of your kitchens. When a strong scouring pad is required, this stainless steel one works. It fits in the palm of the hand and it is standard by weight. This is a great, inexpensive cleaning tool. It handles tough baked-on food with no problem—This is a great product for cleaning pots and pans! I recommend! Stainless steel scoring pads are great to have in the dish pit. They can help get off caked on food from pots, pans, and trays. These are a very inexpensive item that will save lots of time in the dish pit. They are quality and easy to use. We own lots of these. I bought these for cleaning up my cutting boards and my stainless steel tubs. It works great and is what i needed but this is only for ONE pad. Also it eventually lets loos a few stainless steel pieces so rinse off is key. These are could scouring pads. i regularly use them with stainless steel and cast iron pans. I find with little work this is abrasive enough to get all the food off. If you need steel scrubbers, this is a cost-effective item, found it to be just as good as any other I've ever bought and at a fraction of the cost. These scrubbing pads do an excellent job of completely removing lime, calcium, and other buildup, as well as rust. Since these are stainless steel, and I am also careful to let them dry after use, they do not rust. Also, they tend to last a long time. Great product for multiple uses. We use a large number of these scouring pads in our restaurant. Any savings is a great savings, but especially on non food products. These hold up well and are much more economical than our previous scouring pads. These are nice to have in your kitchen for scrubbing tough build-up off of your hot food pans! You can get a lot of use out of each pad, as they are very durable. These stainless steel scouring pads work amazing. They make washing dishes easy and much quicker. It is very handy. I recommend buying this product for those in need. Pads from stores wear out and rust within days. These are larger and heavier than any you can buy in stores. No rust and we have noticed that clean up with these pads are amazing. Rinse and set aside to dry. These pads are amazing. They last a long time, do the job getting grunge and grime and soot off of pots and pans. Highly recommended product! The standard weight stainless steel scouring pad is a great buy and the twelve pack is a great buy. The pads are terrific for cleaning bowls and utensils. Last for multiple washings. Stainless steel scrubber does the job. Quickly clean dirty soiled pots and pans will little effort. These are great, will order them again. Great price too. great price for a pack of 12. we will have these for a while and they seem well made, not too cheap and easy to fall apart. definitely a good product. Great quality product at an excellent price. They are well made and hold up great to withstand more than one use. I will be buying more soon. Good quality really gets the grit and grease off of pans. It does not break down after a few uses it stays strong and is very durable. These are very good at cleaning, but rust quickly. They also break apart easily and we have had small pieces clog our drain and left in pots. Might be able to find a better option. Great for cleaning off burns spot that other scrub cant deal with! Its durable so you can keep using it, price is really affordable! Will buy again! These are average scourers. With heavy use, they would last a couple of weeks at most before falling apart. With occasional use, that stretches to a month or so but you still get pieces of metal breaking off and ending up in the sink. Great quality stainless steel standard weight scouring pad that is great for cleaning large stocks pots. Great prices and really a nice quality scrubbing pad. These stainless steel scouring pads are great. They are perfect for scrubbing things that are really baked on hard to pans. Do not use on nonstick pans. Great value for the price! We were going through way too many heavy weight scouring pads at our coffee and sandwich shop. We switched to these standard weight and they've been great! Equally as powerful scrubbing power, but slightly smaller more manageable size. Recommended! These scour pads are great for cleaning up stuck foods, we have even used them to strip our cast iron pans. They are very well made and last a long time. work well. don't keep their shape for long but when they are new and still in a ball they work magic. they take anything off of any pan you could ever get something stuck to. A great scouring pad made of wonderful quality stainless steel. They are perfect for scrubbing large stock pots and cleaning the slotted spoons. Really great price. 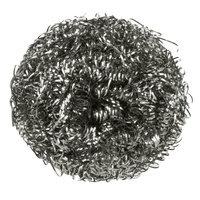 These Steel wool scrubbers are great for those hard to clean surfaces, Floor drains, bathroom tiles, stains etc. We will continue to order these in the future. These scrubby pads are made of stainless steel which is perfect for scouring dirty pans. I wouldn't use these on wooden or marble countertops for fear of scraping. A wonderful and great value stainless steel scouring pads. These are great tools for cleaning the air vents and gratings. They are strong and durable. I love these stainless steel scouring pads. They make it easy to clean caked on food off of my pots and pans. These are cleaning necessities. Good scouring pad for medium scrubbing jobs. Stainless steel, large, and durable. I would recommend a more heavy duty scrubber for certain tasks but it did fine with a little elbow grease. This scouring pad has made cleaning pots and pans so much easier. The surface is this is very rough and far more effective than a sponge at removing stubborn food residue. It's a great price and you get a great item. Works well for cleaning tough pots and pans, or any problem areas on stainless tables. these scouring pads are very durable and since they are made from stainless steel they dont rust like the disposable kind and work much better and last much longer. Excellent scrubber! It works really well scraping off baked on food off of baking pans or other dishes. I love using these when I do the dishes. These little scrubbers work great on caked on food on dishes. The only thing they do that I wish they didn't is trap lots of food in them that can't be rinsed off. Our Seafood market/restaurant uses these steel scrubbers for everything. We use these to clean our fryer/oven to get the tough oil/food stains out. We also use these to clean our dishes and cut stations. Most importantly, we use these to clean our catfish. These pads are excellent in rubbing off the skin on the catfish. Very durable and easy to clean after usage. I highly recommend these to any seafood market. Stainless steel scouring brush! Works great on glass, silverware, and pots and pans that do not have a coating. This came in a pack of 12 and I'm happy I got it! This Stainless Steel scouring pad is exactly as described except I don’t think the description does the quality justice because these are really durable and last awhile even with heavy use. Very dense and easy to clean as well. I really hope additional sizes will be available with this same quality because it is well crafted for sure. This scouring pad works great. We use on our pans after going through the oven. Under a little hot water and soap it will take anything stuck to the pan. 5 stars. Product came as expected, very high quality. I was blown away by the shipping to as it came super fast! I will be using them again. No one can do without a few of these stainless steel pads laying around! These seems to last a little longer than other ones in our opinion. We have purchased a few of these and are happy with them. There is only so much excitement around scouring pads! We needed something to really scrub off caked on food items. This scouring pad gets the job done and done well. Strong, and reusable. Inexpensive as well. These stainless steel scouring pads are strong enough to remove stubborn foods and stains with ease. 12 pack is a great value for your bar or restaurant. These steel wools are perfect for any intense cleaning job. We find that they don't even need soap or degreaser to get tough stains out. These are good scouring pads - I like that they all come individually wrapped so they don't get snagged on each other or other things in storage and that they are a good size - easier to pull one apart into smaller pads. Great for cast iron cleaning! This is a perfect product for the dishwasher. Sometimes you can't help the gravy that gets caked to the bottom of the pan. This is the problem solver! This is an awesome deal for these! These are a lot bigger than the ones I can pick up locally and the wool itself is thicker pieces of steel so they seem to hold up way better than other brands I have used in the past. Tough little scrub pads. I use these scrub char and grease off of the racks of my smoker. They work as they should. Good product. Perfect to use with bar keepers friend when cleaning hard stainless pans and pots, a great way to keep your stainless steel ware up to par. I really like this standard weight scouring pad. I is really well made, really strong but price is great too! It come in convenience sized package of 12! This has been one of my favorite scouring pads ever. It has great texture to it and makes cleaning up dirty pans a breeze. It also doesn't rust like some of the other cleaning pads I've used. The Stainless Steel Standard Weight Scouring Pad are very hardy. They last a long time and dont fall apart when you are using them on your pans. I like using this whenever I have to use barkeeper's friend on really dirty baking pans or pots. It's very durable and does a great job with getting things clean. I find these stainless steel scouring pads to work best on cast iron. They leave marks on the aluminum pans although they do get caked up residue off all types of pots and pans. They are scrubbies. They do a great job of getting the food off of our pots and pans, and they hold up pretty well. Would order again. This scouring pad has been working really well to clean off old cookie sheets. After putting on a homemade cleaner and letting it sit, then using this scouring pad to clean them off, I have been able to clean them up. This is a great price for stainless steel scrubbing pads. They remove the worst messes. The standard weight works great at our house. Highly recommend! These Stainless Steel Standard Weight Scourging Pads and great. My husband bought them for our home. They only problem is that there are 12 which will take a long time to use up. This scouring pad does an extremely effective job. It seems to be made out of much thicker and more tightly coiled metal than what you would get from a retail store. We use it to clean our pyrex baking dish of stuck on food and it does a thorough and quick job. Also, it hold out well over a lot of use. I love these "scrub balls", as my assistant calls them. They get just about anything off the sheet pans and stainless steel pots. They don't stay in the ball shape, but they last a long time. The Stainless Steel Standard Weight Scouring Pads are an excellent buy. The size is great- larger than those you purchase at retail. Great for keeping the baking sheets clean. These scouring pads are top notch! Hold up well after repeatedly being used. Great price! Ships in to us immediately. Cost savings versus buying from our food supplier. Thank you! These work pretty well. The really do take a lot of the effort out when scrubbing anything with "baked on" food. They don't hold their spherical shape all too well, but that's not a huge problem. Overall a good value. These work great for cleaning. It doesn't take nearly as long to clean things with these stainless steel scrubbers, and they even removed caked n food and game. We love these they are a definite must have in any home. Great way to bring back commercial pans that get a lot of burner time. At the price point i am able to have them all over the kitchen, leaving all stainless steel surfaces mirror clean. What a great price on these! We use them for all sorts of cleaning tasks. Very well made and best of all is the great price. Good price on a 12 pack and it doesn't make your shipping go up much at all. Can't complain. Will probably keep buying these regularly. When I bought these scouring pads I knew the quality but I guess I didn't pay attention to the amount of pads that I would get in this one order! I was stunned to see how many came with the small order for the price I paid. Excellent deal!! These are quite useful and definitely worth the price. I have been amazed with all of the different applications I’ve used these for so far! These are great for scrubbing pots with stuck on messes. We also use the. To clean the dough boxes. They hold up for many uses and are very reasonably priced. These Stainless Steel Standard Weight Scouring Pads in a 12 pack are invaluable to me at the restaurant. They are thick, sturdy and economical to purchase in bulk. They do a great job, clean well, and will last a good long time before needing to be replaced. Great scouring pad for cleaning stainless steel vessels. These scouring pads quickly remove stains and such from my steel pans. The great product for great price. A Reastarurant nessecity, these can scrub the dirtiest of pans and clean the worst of stains. These are the generic brand and I see no difference, they work great and last long long time.i hardly have to replace pro tip, we rip ours in half and make two! These stainless steel pads were purchased because we found that it was a better deal than our normal supplier. What a great choice we made. Wonderful product. True stainless steel that won't rust out after getting wet and being left to air dry like steel wool. Size is sufficient multiple uses and the material does not degrade and pull away like steel wool. Works great to scrub out hot woks without having to let them cool. Excellent quality, heavy duty scouring pad. Good quality stainless, as it hasn't rusted at all in months of use. Great for removing shipping oil from carbon steel pans. This Stainless Steel Standard Weight Scouring Pad really helps to get the job done. Baked on messes and grease build up won't stand a chance and at a great price. This all purpose stainless scrubbie ball is good for scouring grease off of pots or other stainless steel surfaces. I would be careful because filaments can get caught in Crevices and clog up a dishwasher. There are several products in the store that we have to boil and it leaves residue on our pots. This is by far (for the price and quality) solution to cleaning them that a simple rag can not do. Great price and material. Have had fake/cheap stainless steel that rusted over time. These are very good and do not rust. Will buy this again. These scrubbing pads are pretty good. They do a good job of cleaning. They do kinda spring apart a bit more than I would like, but they are ok anyway. The price is really good. I have old similar pad that has held up but I wanted a new stainless steel scouring pad. I noticed immediately that steel twirls unravel quite easily and looks like it may fall apart faster than my old one. I could easily pull the strings loose from the design. I am surprised because of all the great reviews. We prepare all of our food with stainless steel items and these pads coming in handy in scrubbing down all of our equipment. These also hold up well after multiple uses. These scouring pads work well and for the price are really great. They don't fall apart easily and work great on tough build up and grease. Will buy again. It should be against the law for any kitchen not to have these in their tool box. We use them to clean everything from pots to deep fryer! We us these pads for cleaning those dried out pans, and the stainless steel makes it long lasting and rust proof. Wouldn't buy the heavy duty simply because you'll replace them at some point either way, and the standard weight does a great job either way, at least for now. These stainless steel standard weight scouring pads just the right size to clean. We change to use new ones after a period of time so we don't need heavy duty ones. These works well with right price. This stainless steel scouring are heavy duty and it last very long. I always purchase variety of brands but so far this is the best one. The one that they sell at restaurant depot worn out very quickly so i have to keep coming back for this one. Works wonders on tough stains and last's longer than most scouring pads. Great price and super durable. Recommended for future orders and any kitchen clean up. These are great for tough cleaning jobs. They are almost impossible to find locally. Nothin works like a steel scratcher for removing stuck on food. Great steel wool. Fits nicely in the hand, blasts through tough stuff sticking on pots and pans, and is nice a big. Much better than residential versions. Fits nicely in the hands and have had no cuts like from other off brand scouring pads. Scrubs through caked on food debris fairly swiftly and is easy to maintain its cleanliness. Nice count for the amount spent. These scouring pads are a great value and a great price thanks to webstaurant store! they last quite awhile and do not chip off metal shavings easily. Thank you! We use this product when cleaning grease build up in kitchens in hotels, hospitals and catering facilities. The product is of great benefit to our crew. Will buy again. I bought this scrubber for my new cast iron pans. It gets the job done. I wish it held its shape a bit better but given the price, it's an amazing value. Great metal scrubbies, perfect for getting rid of stubborn food remnants off any surface. Even works for removing labels off of glass bottles! At this price, you really can't beat it! these are the best for when you have really tough pots and pans to scrub. they last for a while so you do not have to use a new one every time. the price makes this a great deal too. they are just as good as the brand name steel scrubbers. Not much to say about a stainless steel scrubber except that is does the job as expected. I'll continue to order these from webstaurant as needed. These scrubbers are great. They do the job very well. I know that there is no job to big for these guys. I use them around the house and in my business. Make sure you use a cloth between your manicure and the scrubber. The standard weight is outrageously strong. Great value, very sturdy and no sign of rust anywhere. They seem to last much longer than store bought. Also don't be fooled by the picture, they expand much larger with use. These stainless steel scrubs stand up to the test! We go through quite a bit of these making sure everything stays clean and sanitized. They are priced great too - I'm not afraid to buy bulk because of the price! The Stainless Steel Standard Weight Scouring Pads gets the job done. The 12 pack is a great deal. The pads do a great job of getting caked on grease and grime from all of our stainless steel equipment. Great price on these scouring pads. They work well on our pots and pans and steam table items as well. We also use them to clean sides of grills and fryers. This dishwashers go through these like crazy! I bought 4 packs a while ago, and we still have over half left. They seem to last longer than most stainless steel scrubbies. We love them and will be back for more! Just your basic stainless steel scrubby pad. Great for cast iron and carbon steel pan as well as sheet pans. Of course I take a couple of these home every time I order. I recently left a cast iron griddle in a heated oven by mistake. Scrubbed the greasy thing clean with the scouring pad in a jiffy and re-seasoned it. Also great for cleaning steel sinks. The bag of 12 is huge and will surely last me several years. Price is super low. These pads are great for really cleaning baked or fried on foods. Plus, these last longer than any brand I have tried before. I will definitely reorder. The Stainless Steel Standared Weight Scouring Pads sold 12 per pack. They are great and last better than the ones you buy in the store. The price is great too. This scouring pads are great. If you don't use them that much then they last a long time. It really does well taking off caked off burnt food from pans and baking sheets. This thing can cut through the toughest kitchen stain and made my pots and pans shine like new. I don't use it on non-stick surface of course which will definitely wreck your pans. But This is awesome for cleaning stove tops with burnt, stuck on food. These are the classic scouring pads that every kitchen needs. We avoid using them to wash dishes because they can become loose and break apart. We use these for our stove tops and they work great. This is the best priced stainless scruby out there. And not only are they the cheapest but they are also the highest quality. They are not 'name brand' but they work much better and last longer than the rest. These scrubbers are the dishwashers best friend! You can get the toughest baked on foods off of pans and it is also great for scrubbing down applliances! Great in restaurant or house should have a 12 pack laying around works better than sos pads. No matter where i'am i usually carry these because you cant buy these cheap or you don't get quality. these are the old fashioned scrubbers that have always worked great. my mom still uses hers all the time. she won't use anything else, not even the soap filled ones. These are your standard scrubbies but at a discounted pice. Where else can you find them this cheap? They work very well at cleaning many different things. These scouring pads are listed as standard weight, but are comparable to heavy-weight pads from other merchants. They are long-lasting and do a great job. The price is great too! what i like about this stainless steel scouring pad? first is how cheap it is. i haven't seen any place that sells it that cheap. they are meant to be disposable at most restaurants because of food safety issues. The stinless Steel Standard weight scouring pad's are a must in every bakery,reatraunt,or even home,The get hard to scrub food off disses, cause you know if dishes sit a bit ,what a job ,This makes it sooooo much eaiser. These are what we use for 90% of our dishes. They get the job done fast, and last a very long time. And at this price you cant beat it. We were looking for these,and we had always used the green scrubber which worked fine. But for those hard to remove grease or burned these works much better. Great product for cleaning large equipment! Excellent for pots and pans too!!! Great price! Last for several uses! Works great for cleaning walls. High quality scrubber. Works perfectly. Still using the first one out of the pack 2 weeks after opening. Really sturdy and durable. Great value for price paid. Cleans well. This scouring pad is great for cleaning pots, pans and griddles that have hard-to-remove grease. I use it on the griddle to remove the baked-in grease from the hamburger patties and other meats. The scouring pad makes it easy to remove the dirt and all it takes is just a few seconds. This pad is quality-made because unlike other pads it does not bread apart and does not clogs the sink.